The company was originally raised in the Summer of 1471 by Baudouin de Lannoy, lord of Solre and Molenbaix from the county of Hainault. Baudouin died sometime in the late Fall to Early winter of 1474, at which time Jaques Galliot (Jacobo Galetto) was given command from that time until January 1476. Jean de Rubempré was the last commander of the Tenth Company of the Ordonnances from January1476 until the battle of Nancy in January 1477. 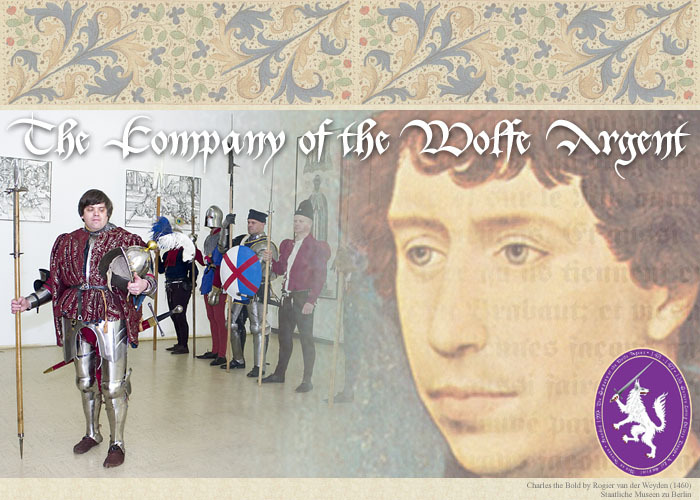 Wolfe Argent covers the full length of the existence of the first Bandes de Ordonnance, but for in-depth interpretation and the purpose of detailed histories of the members we concentrate on the events surrounding the siege of Neuss (1474 - 1475) for interpretive scenarios. Wolfe Argent refers to the livery badge of the chef de chambre, Stephen Philpot (a fictional construct for the purpose of interpretation based on careers of actual English officers in Burgundian service) that is worn in addition to Burgundian livery by his personal retainers that formed the core of the original chambre. Wolfe Argent does both professional historic interpretation - regularly as volunteer staff at the Armory and Museum in Worcester, Massachusetts, and occasionally at other institutions (University of Albany, April 2001), in addition to more traditional reenactment activities. 1. "In the time of the Duke there was made a great Standard, with the image of Saint George, the Guidons and the Cornettes for the different parts of the household, the Archers of the Ducal Guard, and for the twenty Ordonnance Companies; the first standard of the companies had a field of or (gold), with the image of Saint Sebastien, the motto and the device (a tinderbox in the shape of a crown) of the Duke, garnished with fusils, with flames, and the cross of Saint Andre (Andrew - in the shape of two ragged staffs). The 2nd had the image of Saint Adrien on a field of azure (blue), the 3rd had the image of Saint Christopher on a field of argent (silver), the 4th Saint Anthony on a field of rouge (red), the 5th Saint Nicolas on a field of vert (green), the 6th Saint Jhon the Baptist on a field noir (black), the 7th Saint Martin, on the colour sanguin (murry or blood red), the 8th Saint Hubert, on gris (gre), the 9th Saint Catherine, on blanc (white), the 10th Saint Julien, on violet (purple), the 11th Saint Margaret, on tenne (orange), the 12th Saint Avoye, on jeaune (yelloe), the 13th Saint Andre, on noir and violet (black and purple), the 14th Saint Etienne, on vert and noir (green and black), the 15th Saint Peter, on rouge and vert (red and green), the 16th Saint Anne, on bleu and violet (blue and purple), the 17th Saint Jacques, on bleu and or (blue and gold), the 18th Saint Magdelaine, on jeaune and bleu (yellow and blue), the 19th Saint Jerosme, on bleu and arget (blue and silver), the 20th Saint Laurent, on blanc and gris (white and grey)." "The Scandualous Chronicle" by Jean de Troyes.